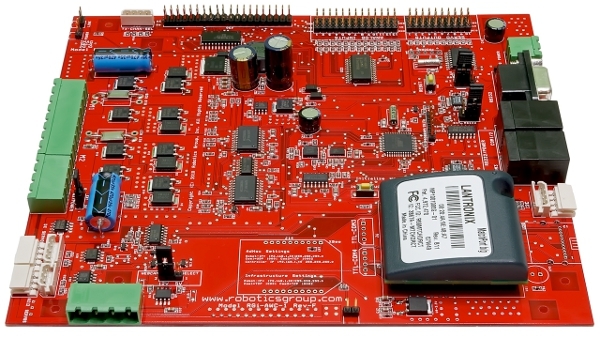 The RGi-Advanced-Wireless-Controller is a 6.2in x 5in (15.75cm x 12.75cm) dual CPU board that embodies a complete robotics control system and development platform. It communicates via wireless 802.11b/g WiFi, ZigBee 900Mhz or 802.15.4 ZigBee communications standards. 10-channel R/C servo controller with 180-degree range (500µs to 2.5ms pulse) and automatic internal/external power switchover. dual high-efficiency motor controller with a capacity of 45A per motor, precision current sensing and limiting, and programmable motor soft start. 13 analog inputs with input protection, filters and 10-bits of resolution. 32 channel Dynamixel AX/DX servo controller with 300-degree range, 1024 steps, and programmable rpm, torque and offsets. A powerful 15A PWM output with 255 steps, capable of switching internal battery and external battery sources. A unique power management system with programmable sleep times, inactivity timeout and direct sleep modes, switchable output power for webcam, motor and radio sections. A high-efficiency, wide-input range, switching, step-down, voltage regulator that provides 6.0V at 3A. A separate voltage regulator that provides 5.0V at 1A, with a powerful 25A switching FET for output power, used for remote power management of webcams, video cameras, etc. An additional voltage regulator that provides 3.3V ad 1A, used for the radio section. Output power of 5.0V is available for sensors via a 3-pin header. The hibernation mode allows the unit to sleep from 1 minute to 18 hours then wake up and restore to full operating conditions, this is critical for performing long-term missions. Pass through communications (available with the WiFi option) allows the controller to connect to our full line of power management, control and sensor systems. On-board I2C port is available for future expansion. Integrated support for infrared and ultrasonic sensors, compatible with the Sharp IR sensor "GP2Y0D02YK" and MaxSonar "EZ1" ultrasonic sensor. Distance measurements are returned in human-readable mode, automatic conversion of sensor readings to inches. Two additional R/C servo outputs that control the "radar scanning" system, an infra-red or ultrasonic sensor can automatically scan 180 degrees and buffer the results in an internal array, this will provide instantaneous access to the most recent distance measurement with out the usual delays to position the sensor and take the reading. Easy to use text and binary modes, isolates the user from complex and arcane binary protocols used to control cameras, ax/dx servos, etc. Optional high-range radio: 900MHz, XBee-PRO with up to 6 miles range when used with high gain antennas. Optional high-range radio: 900MHz, XTend Radio with up to 14-40 miles range when used with high gain antennas. Resets board to default settings. RGi-AWC-1 driving two 12V 30W motors. RGi-AWC-1 using the serial server, The module has a second serial port that the user can use to communicate with other RS232 devices. RGi-AWC-1 Controlling the programmable output intended to a video camera and video transmitter. RGi-AWC-1 of the optional compass module, the module includes internal routines to keep the robot on the same heading. © Copyright 2011 - Robotics Group Inc.